Tuesday, September 9, 1913: Went to Watsontown this afternoon to get some things. When I go shopping, the items that I want to buy determine where I go. If I just need a gallon of milk I walk to the local convenience store, but if I need to buy a week’s worth of groceries I drive to the nearest strip mall. And, if I want to buy some new clothes I head to a more distant large mall. It was the same in Grandma’s day. She often shopped in three towns–McEwensville, Watsontown, and Milton. McEwensville had a general store and pharmacy—and sometimes Grandma could buy what she needed there. Watsontown was a somewhat larger town and had a small shopping district. And, Milton was a little further away, but had more stores. Grandma could have easily walked to McEwensville or Watsontown; a trip to Milton would have required to train or buggy ride. A hundred years ago today Grandma must have needed some things that were relatively common—but not so common that the McEwensville stores would have had them; so she had to visit the medium-sized town. An aside–Maybe the title of this post isn’t really right, since by most standards McEwensville, Watsontown, and Milton are all small towns–but in Grandma’s world she definitely would have differentiated between them and considered one small, the other medium, and the third large. Posted on September 9, 2013 September 7, 2013 by SherylPosted in OtherTagged family history, genealogy. We definitely had things that we would buy locally and also at the small city 50 miles away. The prices were so much less for groceries, but we would only go once a month. I also remember that my family didn’t buy groceries very frequently when I was young. I think that my parents shopped once every 2 or 3 weeks. I guess that we were less dependent upon store-bought foods than what people are now. It had never crossed my mind, but it’s like that with me too….and it was when I was a child! Just depends on what you need as to where (how far!) you go! In remote rural areas people have to go really long distances. Wouldn’t your grandmother be dazzled by the possibility of internet shopping! Amazing the changes we’ve seen! Things sure have changed across the years. In her day, catalog shopping probably was the equivalent of internet shopping today. It was pretty much the same where I live… until little by little the larger stores are moving in, requiring less trips to the bigger city for our shopping (which doesn’t bother me one bit 🙂 ). It definitely is more convenient when stores that sell the things you need are located nearby. Small town shopping is much the same for me today. If I want a mall I have to drive an hour. I try to stay “local” but that’s not always possible. Interesting post and wouldn’t your grandma be thrilled that you are guessing between her lines 100 years later? Oh man, we are so spoiled these days. What I always like about the thought of shopping in these olden day stores was there was far less packaging and someone served you. When compared to today, years ago there were advantages and disadvantages to the shopping experience. If she could walk to the nearest town, they must have been small and very close. Perhaps like districts of big cities? I know there are districts here in Calgary that used to be their own town. Calgary just sort of swallowed them up! They were (and still are distinct) towns. 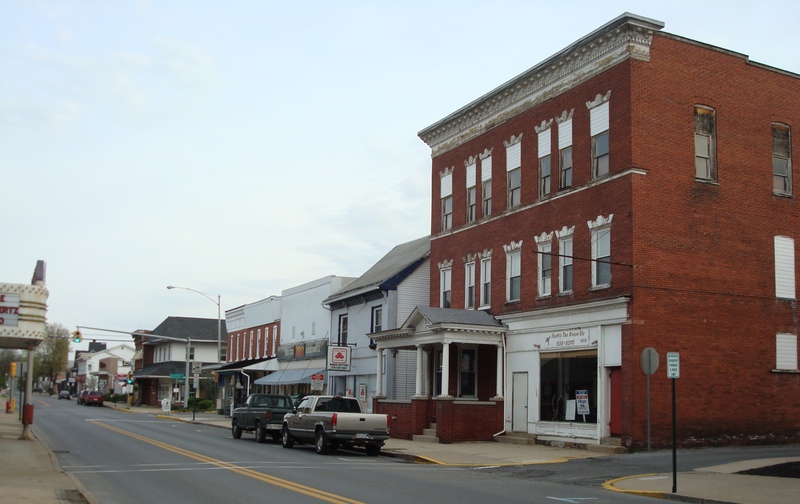 The landscape in central Pennsylvania is dotted with numerous small towns and hamlets. McEwensville was located about a mile and a half east of the Muffly farm. Watsontown was about the same distance–but to the west. And, Milton to the south and was about 5 miles away. In the early part of the 20th century there were many small farms in this area. And, many of the towns had industries. For example, Watsontown had (and still has) a brick factory and several other factories that have since closed. The nearest town for my grandparents required transportation. Going to town was a big all day event. The local general store was prominent in their lives. General stores played a really important role in small communities in days gone by. An interesting post, that shows how shopping hasn’t changed too much, if you don’t consider the internet. I suppose they had catalog shopping too. I also don’t particularly like to shop, and put it off as long as I can. I tend to compile long grocery lists before heading off to the supermarket. This is the second post I have read today that concerned shopping. I am reminded how easy shopping is for us today. I grew up outside a VERY small town so real shopping trips were once or twice a year. My mother would order from a catalog which I suppose would be like shopping online. We do have more choices! I can clearly remember as a child the adventures of a days shopping in Sydney, Australia which was an hour by train from where we lived. There were so many things one could only get in a big city. These days the local mall nearly has all and the excitement is not quite the same. Living in a country area, it is still nevertheless an adventure to visit either Sydney or Melbourne occasionally. You’re right–it still feels like a wonderful adventure when I get the opportunity to shop in a major city. I’m laughing my head off now, too. Thanks for the day-brightener. Your comment also makes me realize how long we’ve known each other via our blogs. I appreciate all of your support. Oh what fun we all had with that, eh Sheryl? … What were these mysterious gigger-mer-rows, for goodness sake!!! Then when I finally chose to meet up with my mum’s elderly cousins and posed the question… they bothed laughed and said in unison “bras”!!! Such fun Sheryl and the joy of it all is stuck in my mind forever. Yep, guess it has been quite a long time since we’ve been communicating via our blogs. Well, your Grandma is my teenager Miss Muffly and I so adore her and it’s fascinating watching her go through her teenage “turmoils” of 100 years ago.